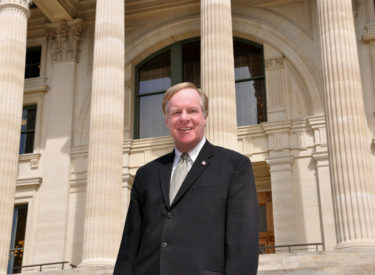 Topeka – Governor Sam Brownback today appointed Nick Jordan to lead the Governor’s Economic Advisory Council and named Sam Williams as the Secretary of Revenue. Secretary Nick Jordan, who has served as Secretary of Revenue since Governor Brownback took office in 2011, will transition to his new role with the Department of Commerce on Dec. 12, 2016. “It is a high honor to work for Governor Brownback, and it is very gratifying to have this new opportunity to move his agenda forward in growing our economy for hardworking Kansas families,” said Jordan. Sam Williams is a retired CFO and managing partner with over 25 years of experience at Sullivan, Higdon, and Sink. He holds a bachelor of arts from the University of Utah. A long time Wichita resident, Williams served on the Wichita Metro Chamber of Commerce as a board member and chair. Governor Brownback tasked Williams with leading the Consensus Revenue Estimating Workgroup earlier this year. “I’m honored to have the opportunity to serve the people of Kansas,” Williams said. Williams will join the Department of Revenue on Dec. 12, 2016. The Secretary of Revenue appointment will require confirmation by the Kansas Senate.